2003This SOTM was submitted by Aaron Gayah who took it at The Cove, Chaguaramas, Trinidad & Tobago. He wrote: “This is an SOTM for my friend, Mary, who is a post-graduate Psychology student researching identity development in the Trinidadian cultural context. You can check out the work she is involved in doing here. “Mary said: I belonged to a youth group in my teenage years. 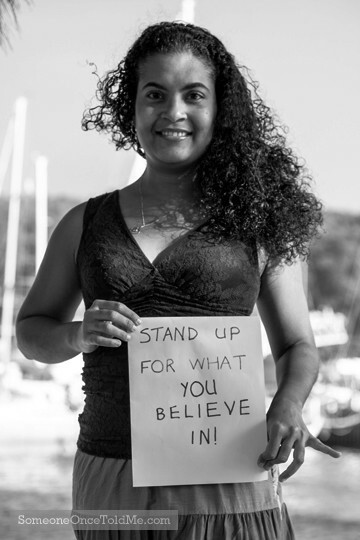 Once, one of the group leaders, Sheldon Narine, facilitated a session called: ‘Stand up for what you believe in’. "I remember it well because we had to write down something we believed in, which I did; but it wasn’t something very close to my heart, so I never felt very satisfied about that event. “Anyway, moving forward to my twenties – much of my behaviour regarding romantic relationships was motivated by pleasing the other, in order to be loved and not alone. This resulted in me often behaving in ways opposed to my life philosophy, but that I felt would make the other person happy. ”Shortly thereafter, I was offered a relationship proposition that was contrary to my life philosophy, and I was actually able to reject it. That act of asserting myself is one of the proudest moments of my life, and the place where it happened is now shrine-like to me. "So HAPPY that you stand up for what you believe in! Not many do and the world needs more people that do! Good for you! It's a challenging path but the rewards are priceless. "